Jeffrey Beall’s blog has no affiliation to any governing body or organization accredited to scholarly publishing. This is an important key element that needs to be considered when analyzing his blog. He is just single individual writing a blog (full of nonsense) same as many others do over the internet. His blog is his personal opinion and has not been tested for its validity and as such has no authority whatsoever. Beall only has a bachelor Degree in Spanish yet he criticizes a wide range of Journals in the vicinity of Social sciences and medical sciences. He is a jack of all trades and nothing more. He has no PhD in any discipline. Jeffrey Beall works in the Auraria Library, University of Colorado, Denver, USA. He is an employee same as everyone else. He began a blog titled “scholarly open access—Critical analysis of scholarly open-access publishing” in the year 2009. His blog is not associated with the university and does not represent the university in any way. Beall, however, utilizes university resources including his university e-mail address for his activities on the blog. His contact information is posted on the blog as follows, e-mail: jeffrey.beall@ucdenver.edu. He does not post his physical location in his blog. Open access is a new, digital, revolutionized way of communicating research among their readers and authors. Not that this has any significance to Beall however, who maintains a list of publishers and Journals that he considers predatory. His highly questionable, probably, and possibly predatory blog discredits many involved in publishing houses. His main targets have been publishing houses and journals from Asia, Africa, and the Middle East. Beall himself created his own criteria for evaluating Open access Journals. The issue here though, is that validity of his criteria has not been tested with any governing authority associated with scholarly publishing. His blog however, clearly stated many other criteria when discrediting Journals. For example, article processing fees in US dollars is one of the reasons he uses to determine when a Journal is predatory. Please read our articles for more information. Beall created two criteria when evaluating journals. In his platinum category, the author charges article processing fees. On the other hand, in the gold category, authors won’t charge article processing fees and papers are published free of charge. This categorization has a serious problem since no organization can financially survive as a publisher without receiving funds for their operation. In order to be successful and be able to survive financially, it is necessary to have some sort of funding mechanism in place. The most Open Access publishers charge is article processing fees. There is no justification for publishing free articles or any mode of publication methods free of charge. University Funds Scammer: Beall is a huge cost to the University of Colorado system? Beall heavily utilized the University of Colorado’s system; including internet, computers, office space, and maintenance of his office such as electricity, cleaning, furniture, and even photocopy machines. He works on his blog on the university’s time while he is being paid by the University to work for them not on his leisure blogging hobby. The only positive is that at a minimum, he has posted a disclaimer page on his blog in which he himself declared that the University of Colorado has no affiliation on his blog. Beall is defrauding the University of Colorado’s system and should be shamed not of anyone else, but only of himself. Despite Beall’s claims of non-affiliation with the University of Colorado, all scamming activities have been conducted utilizing the university’s resources. It appears as though Beall chiefly aims to trade on the University of Colorado’s good name to attract people from abroad to justify his claims on his predatory blog. 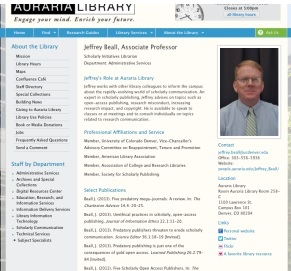 From the profile (http://library.auraria.edu/directory/staff/beall/jeffrey) ,it is glaringly evident Jeffrey Beall is not a scholar; he doesn’t even have a doctoral degree and has not published in any leading/reputable journals. In fact, the only publications he has to his credit (as reflected in his profile) happens to have been produced in the last two years (there is nil track record of prior publications). That too ONLY 7 publications (pretty pathetic track record to claim to be scholarly). He has never served in any academic or editorial committee. Hence his commentaries and statements are merely an opinion by a quasi (self anointed) academic and not scholarly. A blatant attempt to mislead in the pretext of a scholar. 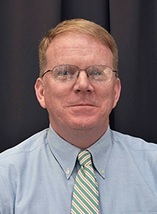 Jeffrey Beall should be sponsored by someone to earn a doctoral degree first before he can even attempt to make a qualified opinion on scholarly publications. His basic degree is from a state university and a masters from another state university. That is hardly scholarly. A very weak attempt to mislead by someone who claims to be an expert with scholarly qualifications. In fact he is trying to sell his services (please visit http://library.auraria.edu/directory/staff/beall/jeffrey) to consult and train whereas he himself needs further education before he can rightfully claim to be an expert. There are numerous cases against Beall, the allegations of which all follow a similar pattern, as many publishing houses and Open access journals revealed their experience with him. At first, Beall’s associate contacted Journals and threatened to blacklist them. Later, he demanded ransom. If anyone pays this ransom, their journal is removed from the list. All those who refused to pay ransom are included into Beall’s hit list. Once a blacklisted journal is included into the so-called Beall list, he will provide opportunity to appeal against his decision. According to his Blog the appeal will hear before a so-called panel. To make matters worse, the names of the individuals in the panel are not listed. Furthermore, the appeal process and procedure are also not published. Their main target is evidently to scam journals and publishing houses. Once the ransom is received Beall removes the Journal from his hit list. Beall’s anti Open Access agenda is driven by major publishing houses. Beall’s list will grow until all popular open access journals have been black listed. This will drive researchers to publish their work in the highly paid open access journals. These groups will control publications from the Human Sciences field to the medical sciences field. They want to take back their control over research publications. Jeffrey Beall's list is not accurate to believe. There are a lot of personal biases of Jeffrey Beall. Two OA publishers have been removed in Jeffrey Beall's list recently. There is no reason given by Jeffrey Beall why they were removed. Jeffrey Beall is naive in his analysis. His blog has become useless. Jeffrey Beall just simply confusing us to promote his academic terrorism. His list is fully questionable. His surveying method is not scientific. If he is a real scientist then he must do everything in standard way without any dispute. He wanted to be famous but he does not have the right to destroy any company name or brand without proper allegation. If we support Jeffrey Beall's work then we are also a part of his criminal activity. Please avoid Jeffrey Beall's fraudulent and criminal activity. Beall utilizes his bribery and unethical business model. We wish to conclude by expressing that Beall’s blacklist in its current form is unnecessary and unreliable. On the one hand, there are professional indexing databases operating as watchdogs of journal quality. Professional databases such as the Web of Science, Scopus or PubMed can be used as whitelists of good journals. Also, professional services and societies, such as the Open Access Scholarly Publishers Association (OASPA), are putting in a great deal of effort to distinguish reputable open access journals and their publishers from scamming activities. On the other hand, Mr. Beall operates as an individual person and does not provide sufficient evidence for his claims, does not attempt to verify his statements for accuracy, nor operate a methodological approach to his appraisals. Beall also denies the right to defense to those that he attacks. Beall’s judgments are therefore to be considered as unreliable, unmethodical and his personal opinions. Beall’s academic fraud and activities must end and everyone must now be more vigilant about these activities.